After running an SSIS package for a migration of a single table from DB2 to SQL Server, I had an error file with 9984 rows that were not able to be migrated. Upon looking at the error file, it looked like every row had failed with an error of -1071607685. So following the instructions of the msdn blog post, I decided to look up the error message. I converted the error number to it’s Hex value (FFFFFFFFC020907B), and looked up this value in the dtsmsg.h file. Hmmm… “DTS_E_OLEDBDESTINATIONADAPTERSTATIC_UNAVAILABLE… No status is available”. Well that’s not very helpful! To make matters even more confusing, when I manually tried to insert one of the failed rows, it successfully inserted with no errors. What the heck?! Time to figure this out. Looking at the destination table structure, I saw there was a unique index on one of the columns. I decided to remove the unique index and give the load another try. BOOM! All rows were inserted into the table with no errors. So there were 9984 different rows that violated the unique constraint on the table? The table structure on the source and destination were identical, so this didn’t sound right. Plus, earlier I was able to manually insert one of the rows into the table, so I knew for a fact that ALL of these rows did not violate the unique constraint. At this point, I was stumped. I couldn’t figure out what the problem seemed to be. SSIS gave me a vague error message and was logging rows to the error file that shouldn’t actually fail to insert. Then, a co-worker reminded me about SSIS batch size and the fast load option. Suddenly it started to make sense. I went back to the SSIS package and saw that DefaultBufferMaxRows was set to 10,000. So, SSIS was loading rows in batches of 10,000. This could explain why there were 9,984 rows in my error file. I changed DefaultBufferMaxRows to 1 on the Data Flow task. 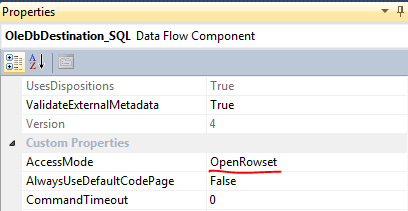 Next, I changed the Data access mode on the OleDBDesination_SQL from “OpenRowset Using FastLoad” to “OpenRowset”. Now SSIS should load the table one row at a time. I dropped and recreated the table (with the unique constraint enabled) to get ready for a fresh load. I started the SSIS package again. BOOM! Only ONE row was logged to the error file now. Hopefully this time it would give me something better than “No Status is Available”. This time the error was -1071607683 (hex value FFFFFFFFC020907D) which translates to “DTS_E_OLEDBDESTINATIONADAPTERSTATIC_INTEGRITYVIOLATION… The data value violates integrity constraints.” MUCH more manageable now! It turns out, the source DB2 database was Case Sensitive and the destination SQL Server database was Case Insensitive. So the duplicate value wasn’t actually a duplicate on the DB2 database, but WAS a duplicate on the SQL Server side. I decided to go back and look at the original error file that had 9984 “error rows”. I found the one row that violated the unique constraint and it had the same -1071607685 error as every other row. There would have been no way to find the one bad row from the original error file. When using large row batch sizes and the FastLoad option in SSIS, be aware of potentially having trouble with the error files. One bad row in a batch of 10,000 caused the entire batch to error out for me, and it took a little bit of work to uncover the actual problem.